James Gurney is the author and illustrator of the New York Times bestselling Dinotopia book series. He designed the World of Dinosaurs stamps for the U.S. Postal Service and has worked on over a dozen assignments for National Geographic magazine, painting reconstructions of Moche, Kushite, and Etruscan civilizations. He has won the Hugo, Chesley, Spectrum, and World Fantasy Awards. Solo exhibitions of his artwork have been presented at over 24 art museums, including the Smithsonian Institution, the Norman Rockwell Museum, and the Norton Museum of Art. 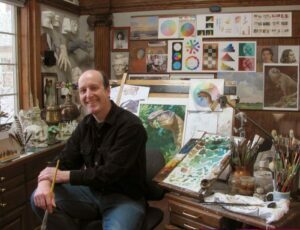 He has recently been named a “Grand Master” by Spectrum Fantastic Arts and a “Living Master” by the Art Renewal Center. His most recent book, Color and Light: A Guide for the Realist Painter (2010) has been Amazon’s #1 bestselling book on painting for over 150 weeks and is based on his daily blog gurneyjourney.blogspot.com.